These are different services Houngans/Mambos provide to their clientel. Divination- this is one of the most common things asked for by a client. Depending on the way it is done, it can cost differently. 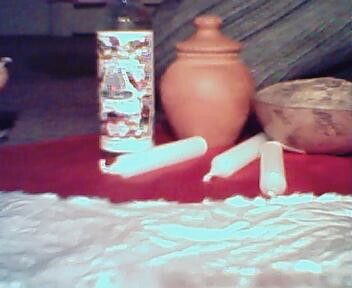 One can get a reading with the cards, a candle and water reading, or get the Houngan/Mambo to call a lwa. While the other two can be done long distance, to call a lwa it is best if the person is present. Wanga-this is the second most commonly requested service. A wanga is a "spell", a "trabajo" if you will. Wangas are done for all sorts of requests, love, money, work, revenge, etc. Wangas can be really simple or extremely complicated. Of course, the more complicated the wanga the more it costs. Gads- A gad is a protection. It is a cut on the skin that has certain herbal powders rubbed into it. It protects people from negative wanga, unneccessary accidents, and so on. It is placed on the point of a lwa. There are other gads, such as the drinking gad. Lave Tet- This is similar to the rogacion in Santeria. Literally translated it means to wash the head. It is a cleansing of the head, a huge cleansing! It removes negative magick, helps possession occur, increases psychic abilities, adds power to the person's magick, strengthens them, draws money and much more. Kanzo- This is the initiation ceremony done within the Haitian Vodou Tradition. It is deeply spiritual and empowering. The secrets are taught to the initiates, and they are empowered. They are given spiritual power items, and much more. Then there are other things we do, such as selling pwen cho, anvwa mo (sending the dead), expeditions, administer magickal baths, consecrate altars, house cleansings, hold dances and much more. Still need more information on what we do?